In temperate and northern regions, spring has finally arrived! But heat also brings mosquitoes, and certain mosquitoes can transfer diseases to your pet, such as heartworm or dirofilariasis. Over the years we have gained a better understanding of dirofilariasis, but it is still worrisome. Prevention is therefore key! 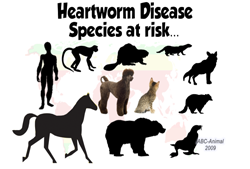 Dirofilariasis can affect several animal species (dogs, cats, coyotes, foxes, beavers, ferrets, wolves, racoons, seals, bears, horses, monkeys, humans…). The disease is transmitted from one animal to another via an infected mosquito. 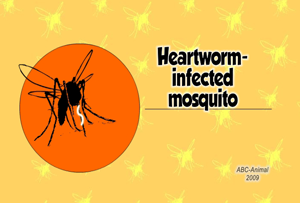 Thus, a bite from a heartworm-carrying mosquito can contaminate your pet with a baby heartworm, or microfilaria. For several months, this microfilaria grows and migrates towards your pet’s heart. Once in the heart and pulmonary arteries, it reaches the adult stage. It can live for 5 to 7 years and reproduce. Your pet’s health will be stealthily affected, since each worm can attain 30 cm in length. Whether your pet lives in the city, in the country or in a temperate or tropical zone, it runs the risk of catching dirofiariasis. The risk is greater if the area is densely populated by dogs, lies between the 45th parallel of the northern hemisphere and the southern hemisphere, or is in a rural and/or wooded area inhabited by wild canidae (coyotes, foxes…). These wild animals blithely cross the borders and spread the disease the way dogs do. In short, dirofilarisasis continues to be cause for concern. Even today, too many people deny the possibility of infection and thus contribute to the steady spread of the parasite in the animal population. Let’s avoid a tragic epidemic. 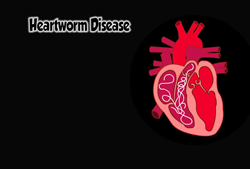 Protect your pet from heartworms every year! The preventive treatment is simple and safe. Give your vet a call. He or she will suggest an annual screening test followed by a treatment adapted to your needs. The treatment continues throughout the mosquito season, and in addition to heartworms, it will also protect your pet from other parasites, such as fleas, tics and gastro-intestinal worms. All of these parasites can affect your pet’s health and your own. Prevention is the best medicine!